New Delhi, March 18: About 60 ships of the Indian Navy, two submarines, 12 ships of the Indian Coast Guard and 60 aircraft were put on operational deployment by the Indian Navy in the North Arabian sea in the wake of the Pulwama terror attack. The Indian Navy today said it had deployed its nuclear submarines and aircraft carrier INS Vikramaditya near the Pakistan waters in Arabian Sea which forced the Pakistan Navy to remain close to its coastline during the escalated India-Pakistan tensions. 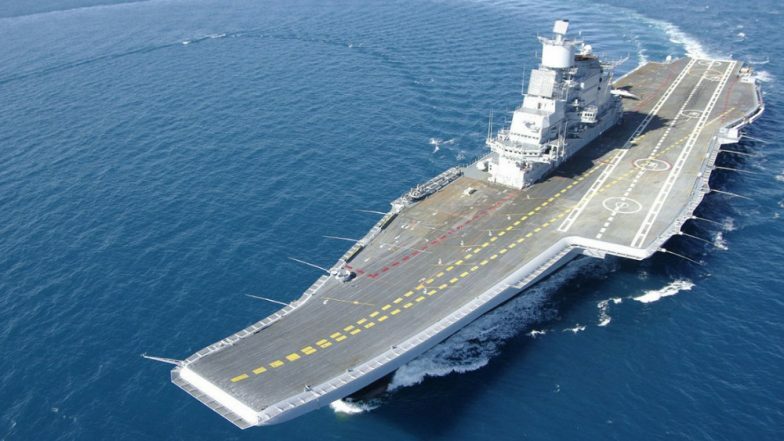 Navy sources said the Russian-leased nuclear submarine INS Chakra was deployed with the carrier battle group of INS Vikramaditya to provide protection to it and also be ready to thwart any offensive action. This news comes after the Indian Navy had said it was in a high state of readiness to "deter, prevent and defeat" any "misadventure" by Pakistan in the maritime domain, reflecting a sense of its preparedness as well as seriousness of the situation. "The major combat units of the Indian Navy including the Carrier Battle Group with INS Vikramaditya, nuclear submarines and scores of other ships, submarines and aircraft swiftly transited from exercise to operational deployment mode as tensions between India and Pakistan escalated," Navy Spokesperson Capt DK Sharma had said at a tri-services press conference on February 28. The announcement by the Indian Navy is in contrast to the previous assertions made by senior government officials that India did not undertake any escalated mobilisation after the Balakot air strikes. This confirmation came as part of a statement issued by the Navy on the "largest war games" codenamed TROPEX. The Indian Navy said, "The exercise had commenced January 7 and was planned to be terminated by 10 Mar, 19. However, the JEM-sponsored terrorist attack on the CRPF convoy in Pulwama on 14 February, 2019 led to the rapid redeployment of the Indian Navy for Operations in North Arabian Sea," it said. The major combat units of the Indian Navy including the Carrier Battle Group with INS Vikramaditya, nuclear submarines and scores of other ships, submarines and aircraft swiftly transited from exercise to operational deployment mode as tensions between India and Pakistan escalated," the statement said. It said the "overwhelming superiority of Indian Navy in all three dimensions forced the Pakistan Navy to remain deployed close to the Makran coast and not venture out in the open ocean". The Navy said "a clear and resolute message regarding the operational posture of the Indian Navy to prevent, deter and defeat any misadventure by Pakistan in the maritime domain was also issued during the tri-services press conference conducted on 28 February. "This is probably the first time that the Navy deployed nuclear submarines -- the indigenous INS Arihant and the Russian INS Chakra -- in an operational role.